JACKSON, CA – The all-New Jackson Rancheria Casino Resort is celebrating completion of five years of renovations with a $2,000,000 Catch Your Dreams Grand Opening. The expansion and remodel cost over $80 million and includes an entirely remodeled 35,000 square foot gaming area, new Poker Room, High Limit Room and Gift Shop, soaring eagle water feature, new main entrance with improved access to the Casino floor, and a completely refurbished Hotel. “We are thrilled to celebrate the Grand Opening of the All-New Jackson Rancheria Casino Resort,” said CEO Rich Hoffman. “It has certainly been a much anticipated process and we appreciate the patience of our loyal guests and employees. Jackson Rancheria has grown tremendously over the years and our most recent renovations reflect that growth.” The $2,000,000 Catch Your Dreams Grand Opening Celebration continues throughout November and December with multiple promotions and events. Decorations and live entertainment throughout the Casino Free commemorative chocolate coins given out at the new entrance 6 p.m. to 9 p.m.
WAR will perform their greatest hits at 7 p.m. in the Grand Oak Ballroom at the Hotel (tickets available online at www.jacksoncasino.com) $5,000 After the WAR Concert Drawing in the casino 9:30 p.m. to 11 p.m.
Grand Opening Cash & Cars Giveaway – Every Friday in November, from 7 p.m. to 11 p.m., players can win five brand new cars and a whole lot of cash and free play. Players can Win a House, on the House just by playing with their Dreamcatcher’s Club ® card between Nov. 18 and Dec. 23. Drawings every Sunday 5 p.m. – 10 p.m. for Free Slot Play and an entry in the House drawing. The drawing for the house, valued at $200,000, will be held on Dec. 30. Each entry has a one in 1,800 chance to winning the house. Lone Wolf Restaurant & Lounge – Located upstairs in the casino, Lone Wolf Restaurant & Lounge features luxury and comfort combined with approachable entrees focused on local quality ingredients and precise execution. The lounge offers fine liqueurs and spirits, a great variety of California wines and an extensive lounge menu. Rancheria Buffet – This expansive buffet seats 300 and features seven mouth-watering stations, including six live action cooking stations where you can watch your meal being prepared. Margaret’s Café & Bakery –A casual dining experience, the menu within Margaret’s Café features Breakfast, Burgers, Salads and other favorites, all available 24 hours a day. The Bakery menu includes Cakes, Pies, Danishes, other favorites. Pacific Grill – Pacific Grill is a combination of two venues – the Asian Grill and the California Grill. It features the combination of cultures from both sides of the Pacific Ocean in a quick serve setting with a shared seating area. JoBo’s Junction – A great place to meet friends and enjoy your favorite coffee drink or a cool ice cream treat. 42 table games including Blackjack, Four-Card Poker, Pai Gow, Three-Card Poker, Ultimate Texas Hold ‘Em, Mini Baccarat, Card Crap, and Roulette. Exclusive Cage with Cashiers who can assist with casino credit and all monetary services. Exclusive dining area for Elite players with complimentary snacks and light meals every day from 8 a.m. to 2 a.m. The newly-renovated, AAA 3 Diamond, 3 Star Hotel offers 86 Deluxe Rooms and Suites and is conveniently located next to the Casino and seven-story parking structure. Visit JacksonCasino.com for details on all the amenities, promotions, entertainment, dining and lodging opportunities. 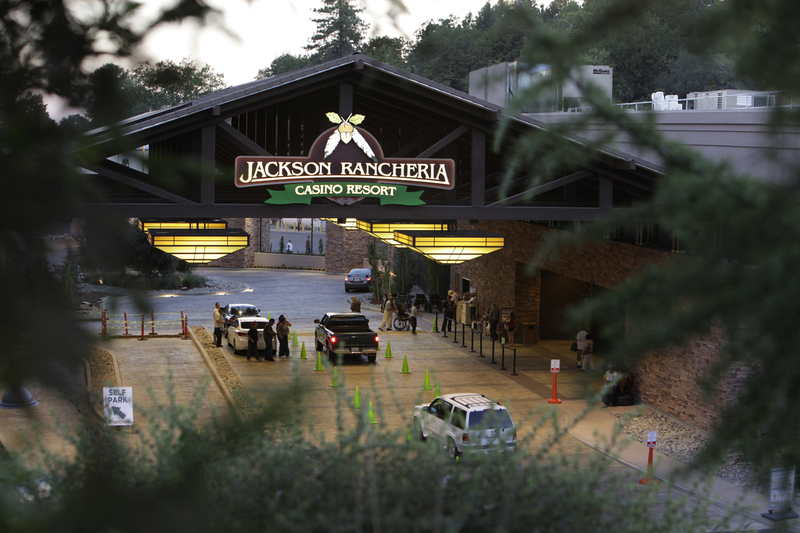 Jackson Rancheria Casino Resort is located at 12222 New York Ranch Road, Jackson, CA 95642. 800-822-WINN (9466), JacksonCasino.com.